Alabama quarterback AJ McCarron’s redshirt junior season has yet to be deemed a successful one by him, as the national championship has yet to be claimed for the Crimson Tide, but many others have taken those duties for him. After being included in the Heisman Trophy talks for several weeks, McCarron has been named a finalist for the Johnny Unitas Golden Arm Award (pictured left) and the Manning Award. “I didn’t even know that until you just told me,” McCarron said. 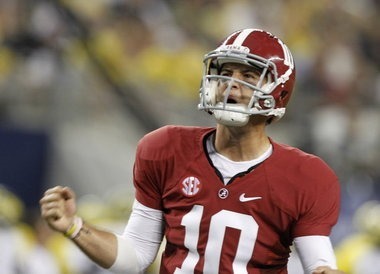 Now that McCarron does know, he probably will think about it just as much as he did before he was aware: none. 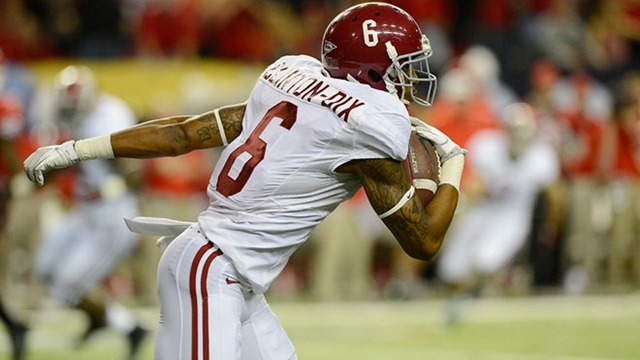 “I don’t think it’s a distraction at all,” McCarron said. “If anything it shows how great my teammates are. This is a game, it doesn’t matter how many individual awards there are, even the Heisman Trophy. It’s not an individual award, as much as people try to make it to be. If you didn’t have your teammates none of that would be possible. McCarron is a finalist with the following players for his three awards. Unitas: Kansas State’s Collin Klein, USC’s Matt Barkley, West Virginia’s Geno Smith and Florida State’s E.J. Manuel. Andrew Luck of Stanford won the award last season. 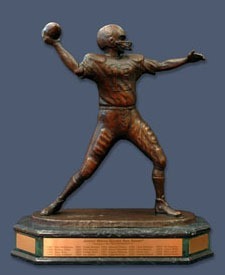 One Alabama quarterback has won the award, Jay Barker in 1994. Manning: Barkley, Klein, Smith, Clemson’s Tajh Boyd, Jordan Lynch of North Illinois, Texas A&M’s Johnny Manziel, Oregon’s Marcus Mariota, Ohio State’s Braxton Miller and Georgia’s Aaron Murray. The Alabama coaching staff has selected eight player for Player of the Week for the week of the 49-0 win in the Iron Bowl over Auburn. Offense: AJ McCarron, Eddie Lacy, Amari Cooper and Barrett Jones. McCarron threw four touchdowns on 15-for-21 passing and 2 16 yards. 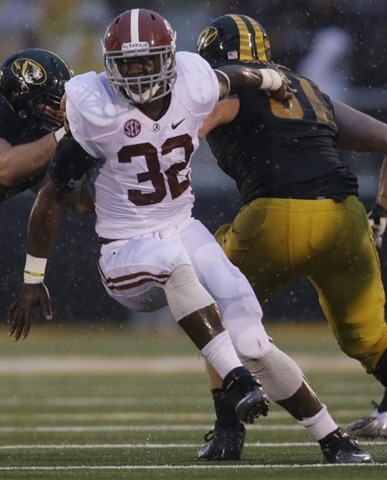 Lacy became the 16th Alabama running back with a 1,000 yard season with his 131 yards on 18 carries. Lacy also scored two touchdowns. Cooper caught five passes, two of them for touchdowns, and 109 yards. This is Cooper’s third 100-yard receiving game of the season as a true freshman. Jones was also named the SEC Offensive Lineman of the Week and, accoring to UA, did not miss an assignment against Auburn. Defense: Robert Lester and Jeoffrey Pagan. Lester intercepted one pass on his Senior Day and returned it for 31 yards. He also led the team with five tackles, four of them solo. Pagan had three tackles, 1.5 for a loss and one sack. Special Teams: Landon Collins and Reggie Ragland. Collins makes it two weeks in a row as being named a special teams players of the week with his two tackles and one punt downed inside the 20. Fellow true freshman Reggie Ragland recorded three assisted tackles on special teams, one inside the 20. Tie at the Top: With Alabama’s 21-17 win over LSU and Boise State’s 21-19 loss to San Diego State last week, the two schools are now tied for the most wins since the beginning of the 2008 season, with 57. Boise State will try to keep with the Tide when it plays Hawaii this Saturday. 10 the Magic Number? : Alabama has held its opponents to 10 or fewer points 38 times in the Nick Saban era, 50 percent of the time. Texas A&M has not been held to less than 10 points since the blackshirts of Nebraska did it in November of 2010, before head coach Kevin Sumlin brought his explosive offense to College Station. AJ for Heisman: The numbers suggest that Alabama quarterback AJ McCarron needs to check the mail every day, as an invitation to New York City may be en route. 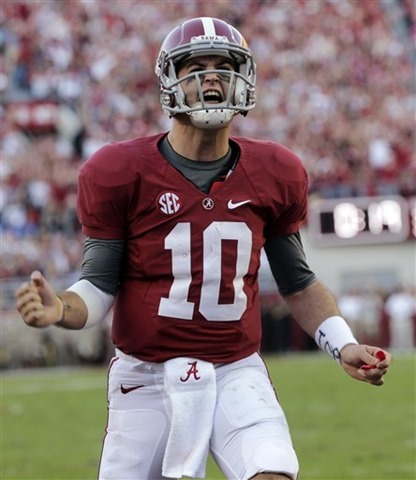 McCarron now has 38 career touchdown passes, 4th in Alabama history and only one behind Greg McElroy’s 39. Brodie Croyle is in second with 41 and John Parker Wilson is in the lead with 47. McCarron is also one touchdown away from tying McElroy’s single-season school record for touchdown passes in a season, with 20. He is also expanding on his school record of attempts without an interception, now at 289. He is only 36 attempts behind the SEC record, held by Andre Woodson of Kentucky. Back to the history books: Alabama and Texas A&M have met four times throughout their history, with the Tide holding a 3-1 advantage in those meetings. 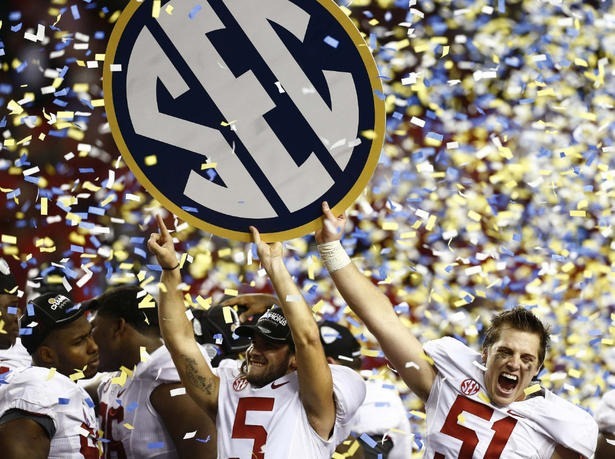 The Aggies took the 1968 Cotton Bowl while Alabama took the 1942 Cotton Bowl and both games of a home-and-home played in Birmingham in 1985 and College Station in 1988. Respect Thy Opponent: Before the game, the University of Alabama will honor some players that played for legendary Alabama coach Paul “Bear” Bryant while he was at Texas A&M. Some of those players have Alabama ties of their own, including Darwin Holt, who played at both schools, and Gene Stallings, who coached the Tide to its 1992 national championship. The Longhorn State in Bryant-Denny: In Bryant-Denny Stadium, Alabama is 9-2 against teams that hail from the state of Texas. Alabama’s 0-2 slate in Tuscaloosa against TCU muddies its 4-0 record against North Texas and 5-0 record against Houston. Texas A&M’s last visit to the state to play Alabama was played at Legion Field in Birmingham, not in Tuscaloosa. Strength v. Strength: Alabama has a nasty habit of not allowing many players to have offensive success against it, while Texas A&M’s Johnny Manziel has done nothing but. Alabama’s defense has not given up 300 total yards of offense to one player since Ryan Mallett accounted for 350 against Alabama in 2010 (Mallett also threw three interceptions, two in the fourth quarter, to lose the game). It was Nov. 3, 2001 the last time Alabama gave up 400 total yards of offense to an individual, when the Tide gave Rohan Davey of LSU 540 yards. Manziel, however, is averaging roughly 383 yards of total offense per game and is reeling after accounting for 440 yards of total offense on the road against Mississippi State last week. Also, the Aggies have scored over 50 points four times this season, twice finding themselves with over 60 points. Alabama has not given up 50 points since the Tennessee Volunteers put 51 on Alabama in 2003. The media guide says Alabama has not given up 60 points, but notes Vanderbilt scored 78 points on Alabama in 1908. From Enemy Territory: Alabama has had success recruiting from the state of Texas and taking players out of one of the nation’s most deep talent pools. Chad Lindsey, reserve offensive lineman; Alec Morris, reserve quarterback; Damion Square, starting defensive lineman; DeAndrew White, injured starting wide receiver; and Cade Foster, starting kicker, all hail from the state of Texas. Off on the right foot: Texas A&M has scored first in all nine of its games so far this season. All on the toss: The Aggies are 6-2 after losing the coin toss, while 1-0 when winning the toss. This is your Useless Stat of the Day. Enjoy. Practice makes perfect. If you can’t get it right in practice, you won’t get it right in the game. Practice is indicative of success in games. You know the drill. When the lights are on, the pressure higher and the crowd on-site, when everything is more difficult, the practice saves you. Or maybe it’s the other way around in the Nick Saban camp. Quarterback AJ McCarron, who put together a 4-for-5, 72 yard performance on Alabama’s game-winning drive in Death Valley, may have had it easier in Baton Rouge than he does in the friendly confines of the Alabama practice facility. Practice, especially when the two-minute portion of each Thursday practice begins, is a hotly-contested affair. Although there is no scoreboard at the practice facility, the competitive flavor is not lost. A thought lingers out that the offense wins about 50 percent of the situations Saban puts them in practice, in which the time left on the clock, number of timeouts left, spot on the field and what’s needed to win or tie variate. “Maybe a little less than that,” linebacker C.J. Mosley said. “Every Thursday, we do our two-minute drill with the offense. Either they need a touchdown or a field goal to score. And coach gives them like a minute thirty, minute fifteen, one timeout, two timeouts. Just different scenarios. Saban said he is, for the most part, happy when the offense finds a way to score in practice. “Sometimes, probably,” McCarron said after a brief chuckle in disbelief. “Sometimes, you’re like, ‘Uh, I kind of wish we didn’t score right there. After countless repetitions of the drill in practice, performing when everything was on the line was no big feat for McCarron. In a way, he found a way to put more pressure on himself.